Desc: Sterling Silver Fanciful Horse head necklace. The Sterling Silver box link chain has a spring ring clasp. The horse head has head arched and the mane is flying out behind. 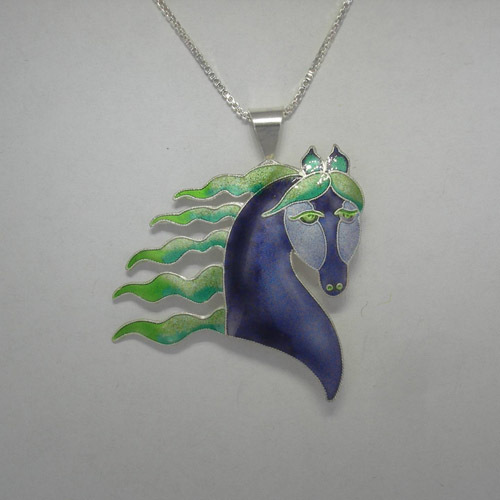 The pendant has vibrant purple* and green enamel. 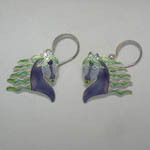 This horse head can be worn as a brooch or as a pendant. The necklace has a bright polish finish. *The purple may appear violet or blue on some computers. We have a matching pair of earrings, see SK938.